The G42 is a 6 -shot, .380 caliber slimline subcompact pistol that is perfect for concealed carry and self defense. It is the smallest, lightest Glock handgun available! Firearms must be shipped via Fedex Overnight, to your selected FFL. This is a flat rate, $40 charge that includes tracking and insurance. Please Note: The Glock 42 is currently not available for sale in California except to active duty Law Enforcement officers. 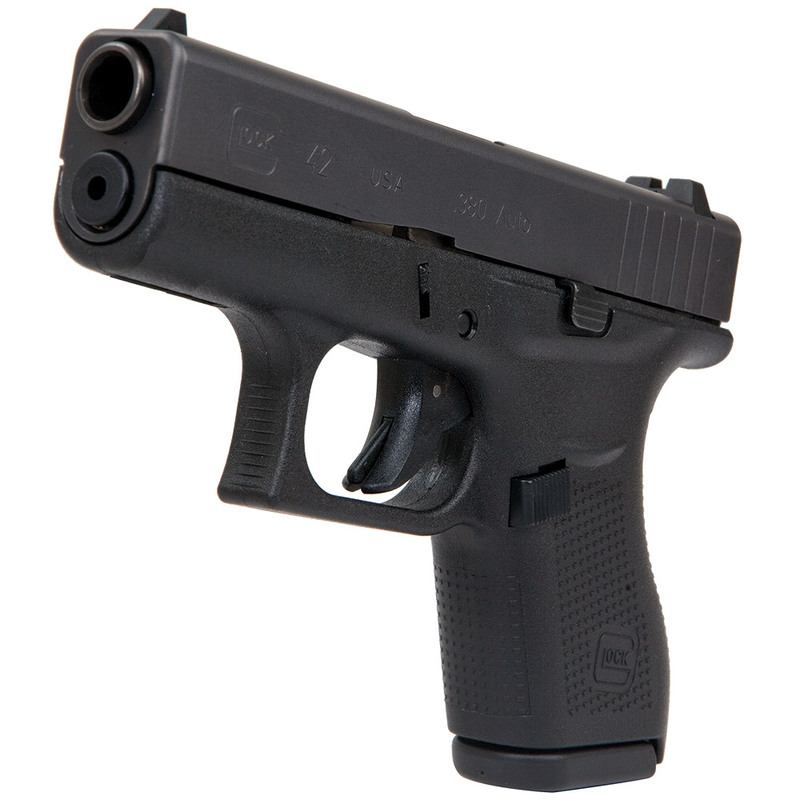 The G42 is a 6-shot, .380 caliber, slimline subcompact pistol engineered with the GLOCK Perfection promise and able to withstand the rigors of concealed carry and everyday shooting. Made in the USA, the G42 is the smallest pistol GLOCK has ever introduced, making it ideal for pocket carry and shooters with smaller hands. We can and will customize this Glock and install parts for you at no charge and ship the gun fully assembled and ready to shoot. Just add the parts to your shopping cart and please make a note in the comments section providing us with any details or special requests. No discounts are available on the purchase of Glock factory handguns. Discounts, if available, will only apply to accessories and parts. NOTE: FFL required for shipment. If you do not have a dealer in mind we can help you find one in your area. If you do have a dealer selected, please note which FFL will be receiving this item in the Comment box during checkout. Failure to do so could delay your order processing and shipping. If your FFL is not already on file, have them fax a signed copy of their license to 858-569-0505 and include your name and order number on the cover sheet. We will contact them to acquire the necessary paperwork before your handgun is shipped. gun and what a blast to shoot.Little bigger them some,but I have big hands. Great little pistol carry it daily.Cant beat little Joe! I bought mine towards the end of the first year it came out and I've had no problems with it. I wear suits most of the time and I can carry mine in an Uncle Mike's pocket holster in my jacket's inner breast pocket or in a Vedder tuckable IWB (appendix) without anyone taking notice. This gun has very low recoil. My kids 9-12 shoot this at the range with me and they have no issues firing it. My oldest fires my G26 and G23/G19 (I have a conversion barrel...thanks Glockstore!) and he enjoys firing the G42 because of the lower recoil. I don't like the trigger on this, which is why I'm getting the 3.5 lbs connector to alleviate the long pull with the hard break. Perhaps it is the size and weight of the gun, but it seems the trigger feels like it has a longer pull and that break is "hard" to get over. This is my summer and slim line wear daily gun. My fall/winter daily gun is a G26. This is the first Glock that I have ever bought and I do not have any regrets whatsoever! A friend of mind recommended it to me. Said that I should get either a 42 or 43. I chose the 42 for the compactness of it and ease of concealment. Do hope to get a 43 eventually. Traded in my Taurus 738 for this gun. Had so many problems with jams with it. Don't have that problem with the Glock. Looking forward to putting several rounds through it at the range. PLUS fun to shoot. Had a Ruger LC9s, way to 'snappy' for my wrist and thumb(arthritis and poorly repaired dislocated thumb), as was son's G43...double stack no go for thumb(G26)...best of all worlds for me. Small, light, easy to shoot(accurate! ), VERY effective with 'proper' ammo(I like Lehigh Xtreme defender)..reliable, typical Glock quality..excellent!